I'm basically making this thread to form a timeline of articles for the History Forum. It's basically a call-to-arms for events, good and bad, that will chronicle the history of the club in the media through articles and specials in newspapers. The more accurate the date the better. Remember, the History board is for items that are up to and including the final day of the Kop. 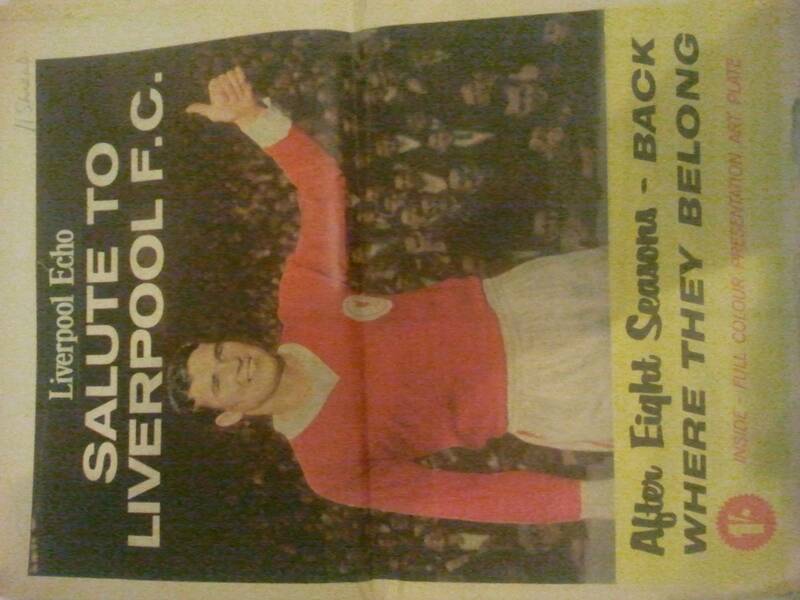 I've personally got articles from around the 60s with a colour special from the Echo in 1962 when we were promoted but I'd love to see this, there must be troves of the stuff in people's attics. And I don't mean stealing stuff from KjellHanssen.com either. Hopefully it takes off anyway, it's something I'd love to see recorded in definitive form. I don't know if it's the kind of thing you're after, but I've got a load of old scrapbooks going back to the 60s, consisting of newspaper pictures from Liverpool games. I've recently started scanning them, cleaning them up (removing old sellotape marks etc) and noting them with date, result etc - if you are interested I can post them on here. I too have got enough stuff to start my own site! Scrapbooks, newspapers and special supplements from 1964 to late 70s. As an example, here's Shankly's first Championship and the first European Cup. I've spent many hours in The Echo archives down town. Its amazing looking through old copies of The Pink reading match reports and Events in the City of the time. All you need to do is look for a significant game or result in our history and pop in with the Date. I've got loads from the 20's and 30's. Please do mate, the more stuff the more educated our fans will be. They're great mate, seem in excellent nick as well. I know I'm bumping an old thread (my own, very bad form!) but I have a few more pages from the top post if anyone's interested? I still have the whole special but it's getting pretty frail now.